Download "CITY OF TORONTO. BY-LAW No. 349-2008"
1 Authority: Licensing and Standards Committee Item 12.3, adopted as amended, by City of Toronto Council on April 28 and 29, 2008 Enacted by Council: April 29, 2008 CITY OF TORONTO BY-LAW No To amend City of Toronto Municipal Code Chapter 629, Property Standards, to add specific standards for guards, handrails, lighting levels and hot water. The Council of the City of Toronto HEREBY ENACTS as follows: 1. 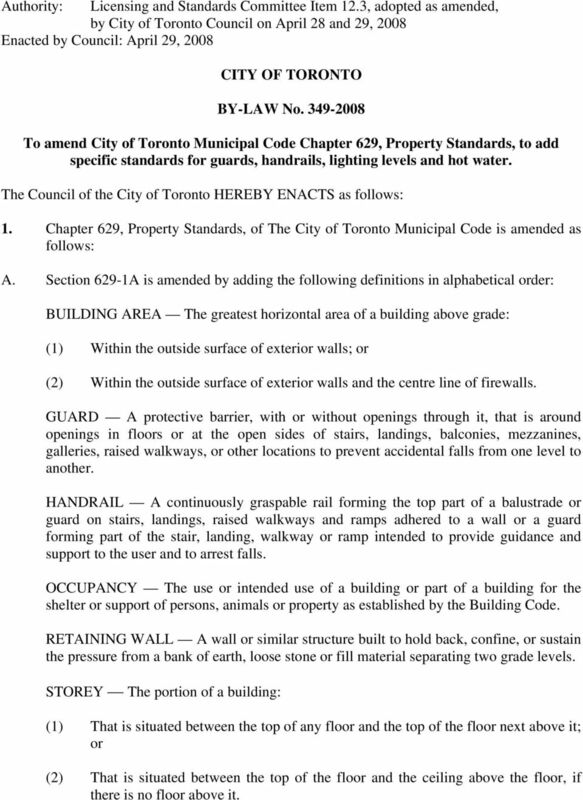 Chapter 629, Property Standards, of The City of Toronto Municipal Code is amended as follows: A. 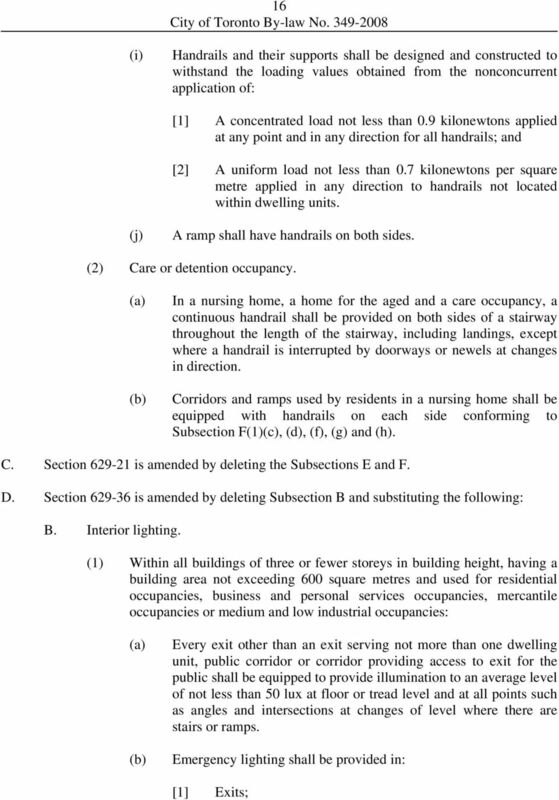 Section 629-1A is amended by adding the following definitions in alphabetical order: BUILDING AREA The greatest horizontal area of a building above grade: (1) Within the outside surface of exterior walls; or (2) Within the outside surface of exterior walls and the centre line of firewalls. GUARD A protective barrier, with or without openings through it, that is around openings in floors or at the open sides of stairs, landings, balconies, mezzanines, galleries, raised walkways, or other locations to prevent accidental falls from one level to another. HANDRAIL A continuously graspable rail forming the top part of a balustrade or guard on stairs, landings, raised walkways and ramps adhered to a wall or a guard forming part of the stair, landing, walkway or ramp intended to provide guidance and support to the user and to arrest falls. OCCUPANCY The use or intended use of a building or part of a building for the shelter or support of persons, animals or property as established by the Building Code. RETAINING WALL A wall or similar structure built to hold back, confine, or sustain the pressure from a bank of earth, loose stone or fill material separating two grade levels. STOREY The portion of a building: (1) That is situated between the top of any floor and the top of the floor next above it; or (2) That is situated between the top of the floor and the ceiling above the floor, if there is no floor above it. 2 2 B. Section is amended by deleting Subsections B and C and substituting the following: B. Retaining walls. (1) A retaining wall exceeding 1,000 millimetres in exposed height shall be protected by a guard on all open sides where access to the open space is provided at the top of the retaining wall. (2) Required guards as described in Subsection B(1) shall be constructed and maintained in accordance with Subsection C or D based on the type of occupancy established for the building on the property. 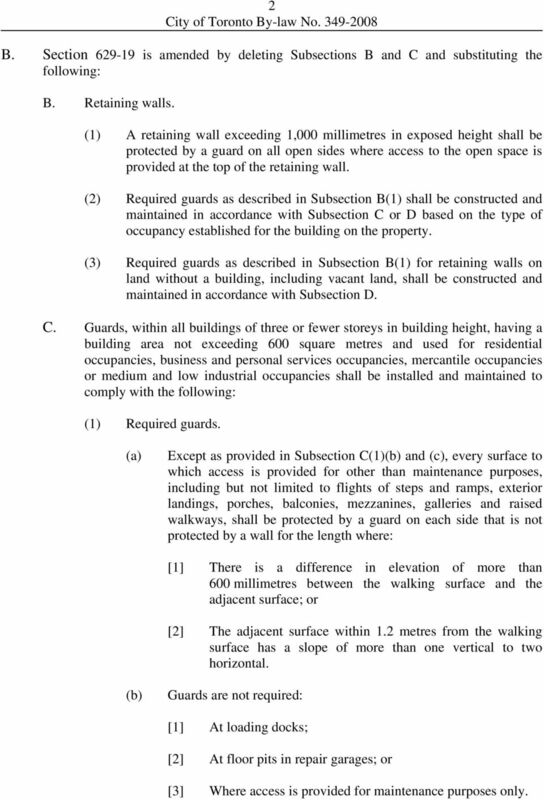 (3) Required guards as described in Subsection B(1) for retaining walls on land without a building, including vacant land, shall be constructed and maintained in accordance with Subsection D. C. Guards, within all buildings of three or fewer storeys in building height, having a building area not exceeding 600 square metres and used for residential occupancies, business and personal services occupancies, mercantile occupancies or medium and low industrial occupancies shall be installed and maintained to comply with the following: (1) Required guards. Except as provided in Subsection C(1) and, every surface to which access is provided for other than maintenance purposes, including but not limited to flights of steps and ramps, exterior landings, porches, balconies, mezzanines, galleries and raised walkways, shall be protected by a guard on each side that is not protected by a wall for the length where:  There is a difference in elevation of more than 600 millimetres between the walking surface and the adjacent surface; or  The adjacent surface within 1.2 metres from the walking surface has a slope of more than one vertical to two horizontal. Guards are not required:  At loading docks;  At floor pits in repair garages; or  Where access is provided for maintenance purposes only. 3 3 When an interior stair has more than two risers or an interior ramp rises more than 400 millimetres, the sides of the stair or ramp and the landing or floor level around the stairwell or ramp shall be protected by a guard on each side that is not protected by a wall. (2) Height of guards. 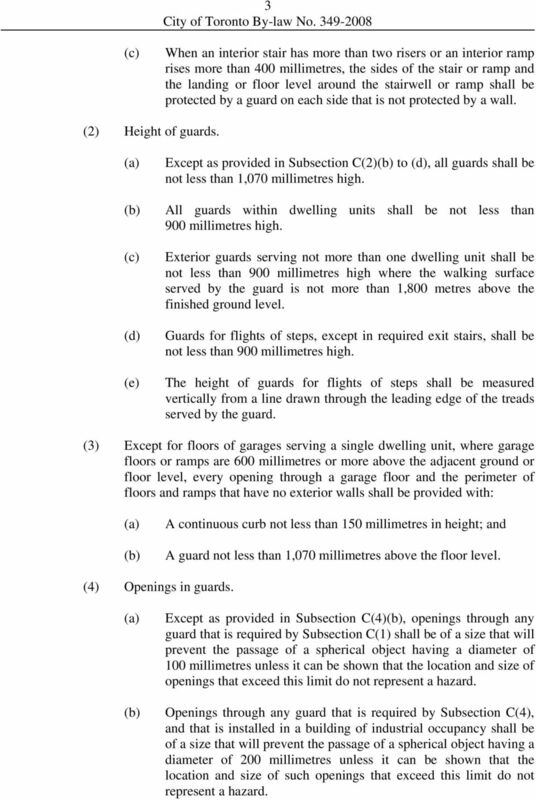 (d) (e) Except as provided in Subsection C(2) to (d), all guards shall be not less than 1,070 millimetres high. All guards within dwelling units shall be not less than 900 millimetres high. Exterior guards serving not more than one dwelling unit shall be not less than 900 millimetres high where the walking surface served by the guard is not more than 1,800 metres above the finished ground level. Guards for flights of steps, except in required exit stairs, shall be not less than 900 millimetres high. The height of guards for flights of steps shall be measured vertically from a line drawn through the leading edge of the treads served by the guard. (3) Except for floors of garages serving a single dwelling unit, where garage floors or ramps are 600 millimetres or more above the adjacent ground or floor level, every opening through a garage floor and the perimeter of floors and ramps that have no exterior walls shall be provided with: A continuous curb not less than 150 millimetres in height; and A guard not less than 1,070 millimetres above the floor level. (4) Openings in guards. Except as provided in Subsection C(4), openings through any guard that is required by Subsection C(1) shall be of a size that will prevent the passage of a spherical object having a diameter of 100 millimetres unless it can be shown that the location and size of openings that exceed this limit do not represent a hazard. Openings through any guard that is required by Subsection C(4), and that is installed in a building of industrial occupancy shall be of a size that will prevent the passage of a spherical object having a diameter of 200 millimetres unless it can be shown that the location and size of such openings that exceed this limit do not represent a hazard. 4 4 Unless it can be shown that the location and size of openings that do not comply with the following limits do not represent a hazard, openings through any guard that is not required by Subsection C(1), and that serves a building of other than industrial occupancy, shall be of a size that:  Will prevent the passage of a spherical object having a diameter of 100 millimetres; or  Will permit the passage of a spherical object having a diameter of 200 millimetres. (5) Climbing prevention in guard design. 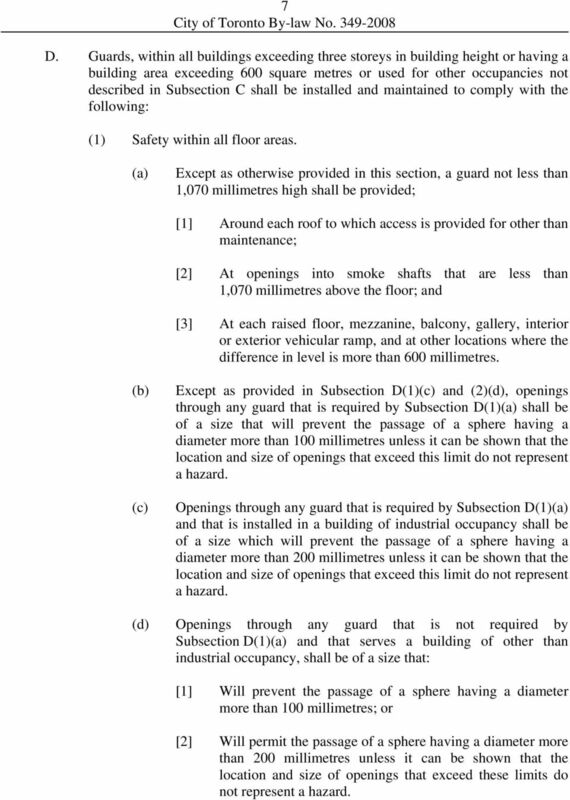 Guards required by Subsection C(1), except those in industrial occupancies and where it can be shown that the location and size of openings do not represent a hazard, shall be designed so that no member, attachment or opening will facilitate climbing. Guards shall be deemed to comply with Subsection C(5) where any elements protruding from the vertical and located within the area between 140 millimetres and 900 millimetres above the floor or walking surface protected by the guard:  Are located more than 450 millimetres horizontally and vertically from each other;  Provide not more than 15 millimetres horizontal offset;  Do not provide a toe-space more than 45 millimetres horizontally and 20 milllimetres vertically; or  Present more than a slope of one vertical to two horizontal slope on the offset. (6) Glass in guards shall be: Safety glass of the laminated or tempered type conforming to CAN/CGSB-12.1-M, Tempered or Laminated Safety Glass ; or Wired glass conforming to CAN/CGSB M, Wired Safety Glass. (7) Loads on guards. 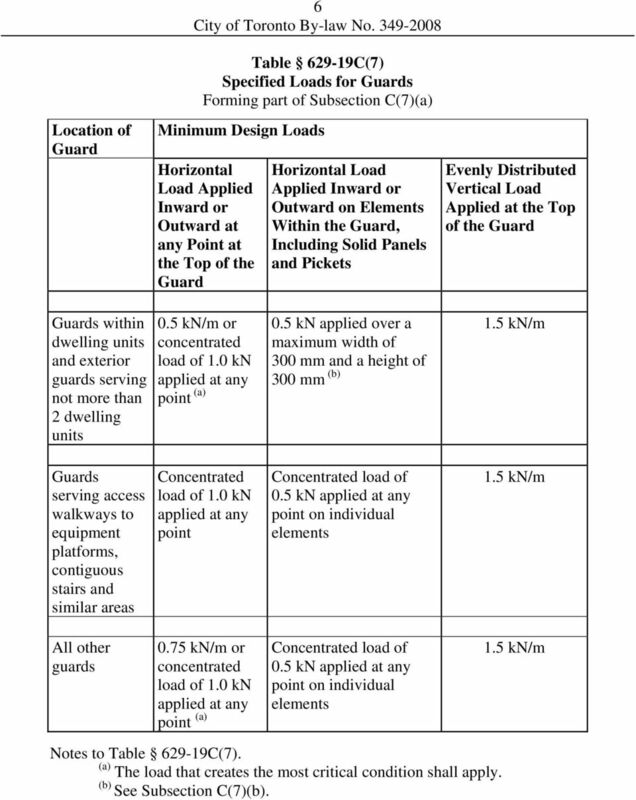 Guards shall be designed to resist the loads specified in Table C(7). 5 5 (d) Where the width and spacing of balusters in guards within dwelling units, and exterior guards serving not more than two dwelling units is such that three balusters can be engaged by a load imposed over the 300 millimetre width, the load shall be imposed so as to engage three balusters. None of the loads specified in Table C(7) need to be considered to act simultaneously. For guards within dwelling units and for exterior guards serving not more than two dwelling units, Table C(7) need not apply where the guard construction has been demonstrated to provide effective performance. 6 6 Table C(7) Specified Loads for Guards Forming part of Subsection C(7) Location of Guard Minimum Design Loads Horizontal Load Applied Inward or Outward at any Point at the Top of the Guard Horizontal Load Applied Inward or Outward on Elements Within the Guard, Including Solid Panels and Pickets Evenly Distributed Vertical Load Applied at the Top of the Guard Guards within dwelling units and exterior guards serving not more than 2 dwelling units 0.5 kn/m or concentrated load of 1.0 kn applied at any point 0.5 kn applied over a maximum width of 300 mm and a height of 300 mm 1.5 kn/m Guards serving access walkways to equipment platforms, contiguous stairs and similar areas Concentrated load of 1.0 kn applied at any point Concentrated load of 0.5 kn applied at any point on individual elements 1.5 kn/m All other guards 0.75 kn/m or concentrated load of 1.0 kn applied at any point Concentrated load of 0.5 kn applied at any point on individual elements 1.5 kn/m Notes to Table C(7). The load that creates the most critical condition shall apply. See Subsection C(7). 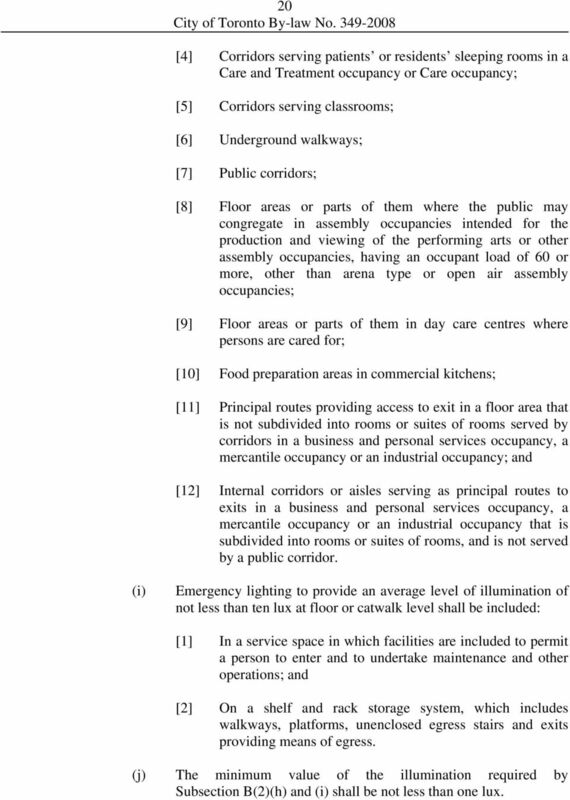 7 7 D. Guards, within all buildings exceeding three storeys in building height or having a building area exceeding 600 square metres or used for other occupancies not described in Subsection C shall be installed and maintained to comply with the following: (1) Safety within all floor areas. Except as otherwise provided in this section, a guard not less than 1,070 millimetres high shall be provided;  Around each roof to which access is provided for other than maintenance;  At openings into smoke shafts that are less than 1,070 millimetres above the floor; and  At each raised floor, mezzanine, balcony, gallery, interior or exterior vehicular ramp, and at other locations where the difference in level is more than 600 millimetres. Except as provided in Subsection D(1) and (2)(d), openings through any guard that is required by Subsection D(1) shall be of a size that will prevent the passage of a sphere having a diameter more than 100 millimetres unless it can be shown that the location and size of openings that exceed this limit do not represent a hazard. Openings through any guard that is required by Subsection D(1) and that is installed in a building of industrial occupancy shall be of a size which will prevent the passage of a sphere having a diameter more than 200 millimetres unless it can be shown that the location and size of openings that exceed this limit do not represent a hazard. (d) Openings through any guard that is not required by Subsection D(1) and that serves a building of other than industrial occupancy, shall be of a size that:  Will prevent the passage of a sphere having a diameter more than 100 millimetres; or  Will permit the passage of a sphere having a diameter more than 200 millimetres unless it can be shown that the location and size of openings that exceed these limits do not represent a hazard. 8 8 (e) (f) Unless it can be shown that the location and size of openings do not present a hazard, a guard shall be designed so that no member, attachment or opening located between 140 millimetres and 900 millimetres above the level protected by the guard will facilitate climbing. Subsection D(1) does not apply at the front edges of stages, floor pits in repair garages and loading docks. (2) Assembly occupancy. 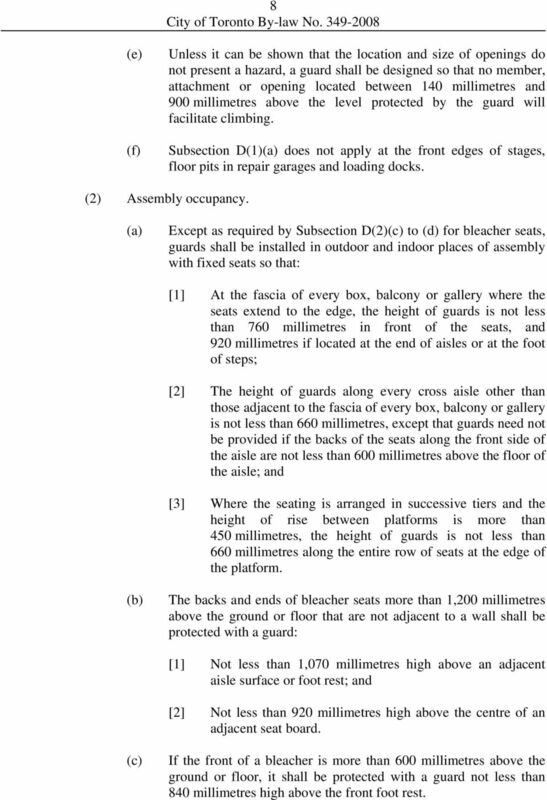 Except as required by Subsection D(2) to (d) for bleacher seats, guards shall be installed in outdoor and indoor places of assembly with fixed seats so that:  At the fascia of every box, balcony or gallery where the seats extend to the edge, the height of guards is not less than 760 millimetres in front of the seats, and 920 millimetres if located at the end of aisles or at the foot of steps;  The height of guards along every cross aisle other than those adjacent to the fascia of every box, balcony or gallery is not less than 660 millimetres, except that guards need not be provided if the backs of the seats along the front side of the aisle are not less than 600 millimetres above the floor of the aisle; and  Where the seating is arranged in successive tiers and the height of rise between platforms is more than 450 millimetres, the height of guards is not less than 660 millimetres along the entire row of seats at the edge of the platform. The backs and ends of bleacher seats more than 1,200 millimetres above the ground or floor that are not adjacent to a wall shall be protected with a guard:  Not less than 1,070 millimetres high above an adjacent aisle surface or foot rest; and  Not less than 920 millimetres high above the centre of an adjacent seat board. If the front of a bleacher is more than 600 millimetres above the ground or floor, it shall be protected with a guard not less than 840 millimetres high above the front foot rest. 10 10 than 1,070 millimetres high measured to the top of the guard from the surface of the landing; and  Be fixed in position and designed to resist the lateral design loads specified for guards and walls in accordance with Subsection D(5). 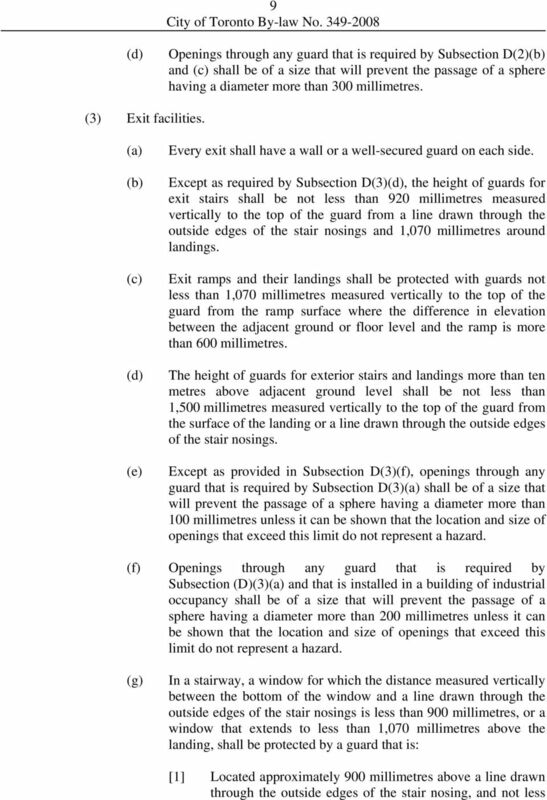 (h) Unless it can be shown that the location and size of openings do not present a hazard, a guard shall be designed so that no member, attachment or opening located between 140 millimetres and 900 millimetres above the level being protected by the guard will facilitate climbing. (4) Window protection in apartment buildings. Within apartment building occupancies, as described in accordance with the Building Code, protection shall be provided at windows to minimize the hazards to children in accordance with Subsection D(4) to (d). Fixed windows within dwelling units that extend to less than 1,000 millimetres from the floor shall be protected by guards to at least 1,000 mm above the floor, or shall be designed to withstand the lateral design loads for balcony guards in accordance with Subsection D(5). Except as provided in Subsection D(4)(d), in dwelling units any window located more than 2,000 millimetres above grade that opens within 1,500 millimetres of the floor shall be protected:  By a guard conforming to Subsection D(5);  By: [a] A controlled sash operation to restrict, when engaged, the opening of the operable sash to not more than 100 millimetres; and [b] A heavy duty screen conforming to CAN/CSA-A440, Windows ; or  By an alternative device that does not reduce the degree of safety provided by Subsection D(4) or . (d) Protection of a window need not be provided in a dwelling unit where an exterior balcony is constructed for the full length of a window. 11 (5) Loads on guards. 11 The minimum specified horizontal load applied inward or outward at the top of every required guard shall be:  3.0 kilonewtons per metre for means of egress in grandstands, stadia, bleachers and arenas;  A concentrated load of 1.0 kilonewtons applied at any point for access ways to equipment platforms, contiguous stairs and similar areas where the gathering of many people is improbable; and  0.75 kilonewtons per meter or a concentrated load of 1.0 kilonewtons applied at any point, whichever governs for locations other than those described in Subsection D(5) and . (d) (e) (f) Individual elements within the guard, including solid panels and pickets, shall be designed for a load of 0.5 kilonewtons applied over an area of 100 millimetres by 100 millimetres located at any point in the element or elements so as to produce the most critical effect. The loads required in Subsection D(5) need not be considered to act simultaneously with the loads provided for in Subsection D(5) and (d). 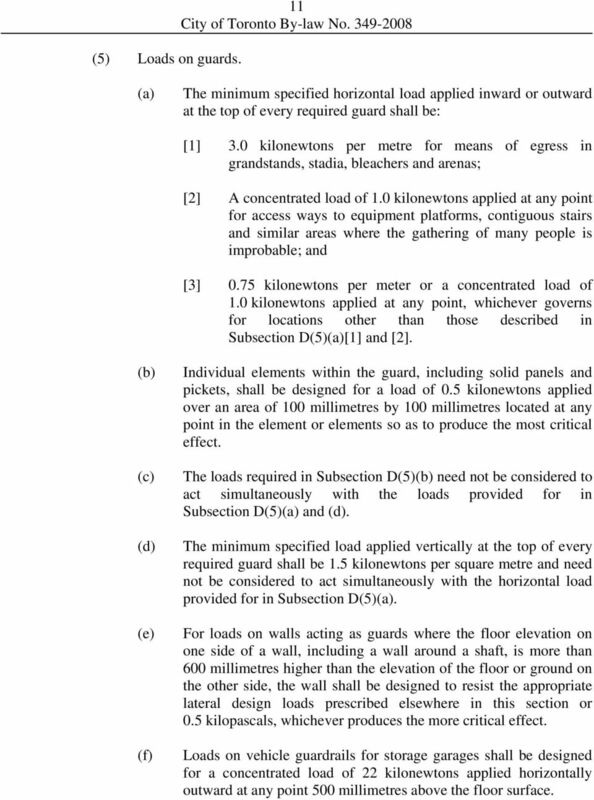 The minimum specified load applied vertically at the top of every required guard shall be 1.5 kilonewtons per square metre and need not be considered to act simultaneously with the horizontal load provided for in Subsection D(5). For loads on walls acting as guards where the floor elevation on one side of a wall, including a wall around a shaft, is more than 600 millimetres higher than the elevation of the floor or ground on the other side, the wall shall be designed to resist the appropriate lateral design loads prescribed elsewhere in this section or 0.5 kilopascals, whichever produces the more critical effect. Loads on vehicle guardrails for storage garages shall be designed for a concentrated load of 22 kilonewtons applied horizontally outward at any point 500 millimetres above the floor surface. 12 12 E. Handrails within all buildings of three or fewer storeys in building height, having a building area not exceeding 600 square metres and used for residential occupancies, business and personal services occupancies, mercantile occupancies or medium and low industrial occupancies shall be installed and maintained in accordance with the following: (1) Required handrails. Except as permitted in Subsection E(1) and, a handrail shall be provided:  On at least one side of stairs or ramps less than 1,100 millimetres in width;  On two sides of curved stairs or ramps of any width, except curved stairs within dwelling units; and  On two sides of stairs or ramps 1,100 millimetres in width or greater. Handrails are not required for:  Interior stairs having not more than two risers and serving a single dwelling unit;  Exterior stairs having not more than three risers and serving a single dwelling unit;  Ramps with a slope of not less than a slope of one vertical to 12 horizontal; or  Ramps rising not more than 400 millimetres. Only one handrail is required on exterior stairs having more than three risers if the stairs serve a single dwelling unit. (2) Continuity of handrails. Except as provided in Subsection E(2), at least one required handrail shall be continuous throughout the length of the stair or ramp, including landings, except where interrupted by:  Doorways; or  Newel posts at changes in direction. 13 13 For stairs or ramps serving a single dwelling unit, at least one handrail shall be continuous throughout the length of the stair or ramp, except where interrupted by:  Doorways;  Landings; or  Newel posts at changes in direction. (3) Termination of handrails. Handrails shall be terminated in a manner that will not obstruct pedestrian travel or create a hazard. Except for stairs and ramps serving a single dwelling unit, at least one handrail at the sides of a stair or ramp shall extend horizontally not less than 300 millimetres beyond the top and bottom of each stair or ramp. (4) Height of handrails. The height of handrails on stairs and ramps shall be measured vertically from the top of the handrail to:  A line drawn through the leading edge of the stair treads served by the handrail; or  The surface of the ramp, floor or landing served by the handrail. 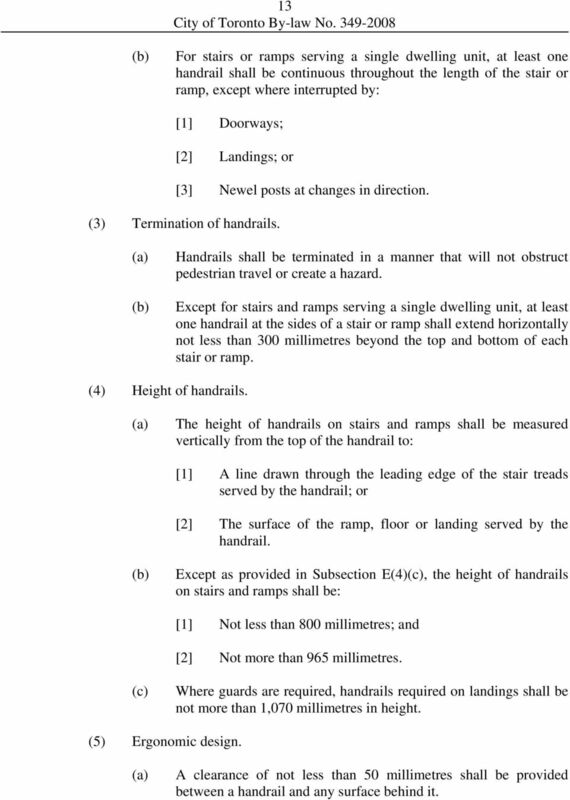 Except as provided in Subsection E(4), the height of handrails on stairs and ramps shall be:  Not less than 800 millimetres; and  Not more than 965 millimetres. 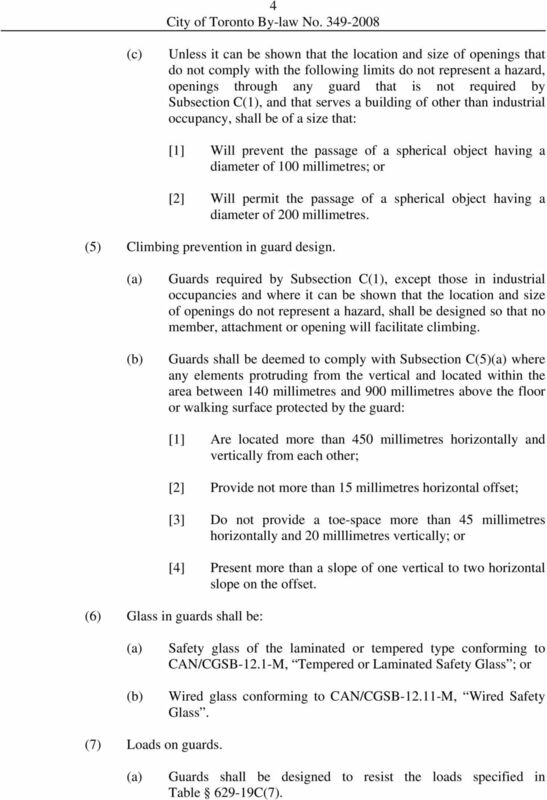 Where guards are required, handrails required on landings shall be not more than 1,070 millimetres in height. (5) Ergonomic design. A clearance of not less than 50 millimetres shall be provided between a handrail and any surface behind it. 14 14 All handrails shall be constructed so as to be continually graspable along their entire length with no obstruction on or above them to break a handhold, except where the handrail is interrupted by newels at changes in direction. (6) Handrails and projections below handrails, including handrail supports and stair stringers shall not project more than 100 millimetres into the required width of a stair or ramp. (7) Design and attachment of handrails. Handrails and any building element that could be used as a handrail shall be designed and attached in such a manner to resist:  A concentrated load at any point of not less than 0.9 kilonewtons; and  For handrails other than those serving a single dwelling unit, a uniformly distributed load of 0.7 kilonewtons. Where a handrail serving a single dwelling unit is attached to wood studs or blocking, the attachment shall be deemed to comply with Subsection E(7) where:  The attachment points are spaced not more than 1.2 metres apart;  The first attachment point at either end is located not more than 300 millimetres from the end of the handrail; and  The fasteners consist of no fewer than two wood screws at each point, penetrating not less than 32 millimetres into solid wood. 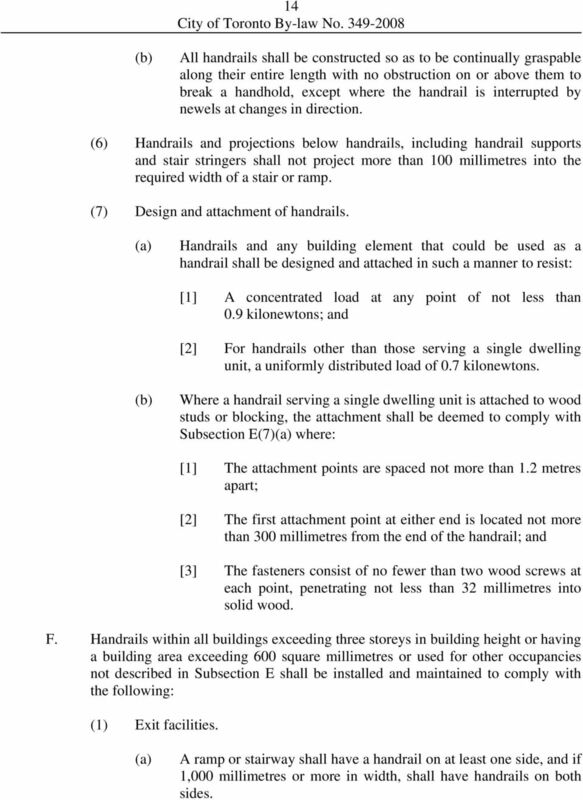 F. Handrails within all buildings exceeding three storeys in building height or having a building area exceeding 600 square millimetres or used for other occupancies not described in Subsection E shall be installed and maintained to comply with the following: (1) Exit facilities. A ramp or stairway shall have a handrail on at least one side, and if 1,000 millimetres or more in width, shall have handrails on both sides. 15 15 If the required width of a ramp or flight of stairs is more than 2,200 millimetres, one or more intermediate handrails continuous between landings shall be provided, and located so that there will be not more than 1,650 millimetres between handrails. Handrails shall be continuously graspable along their entire length and shall have:  A circular cross-section with an outside diameter not less than 30 millimetres and not more than 43 millimetres; or  Any non-circular shape with a graspable portion that has a perimeter not less than 100 millimetres and not more than 125 millimetres and whose largest cross-sectional dimension is not more than 45 millimetres. (d) (e) (f) (g) Handrails on stairs and ramps shall be not less than 865 millimetres and not more than 965 millimetres high, measured vertically from a line drawn through the outside edges of the stair nosing or from the surface of the ramp, except that handrails not meeting these requirements are permitted provided they are installed in addition to the required handrail. 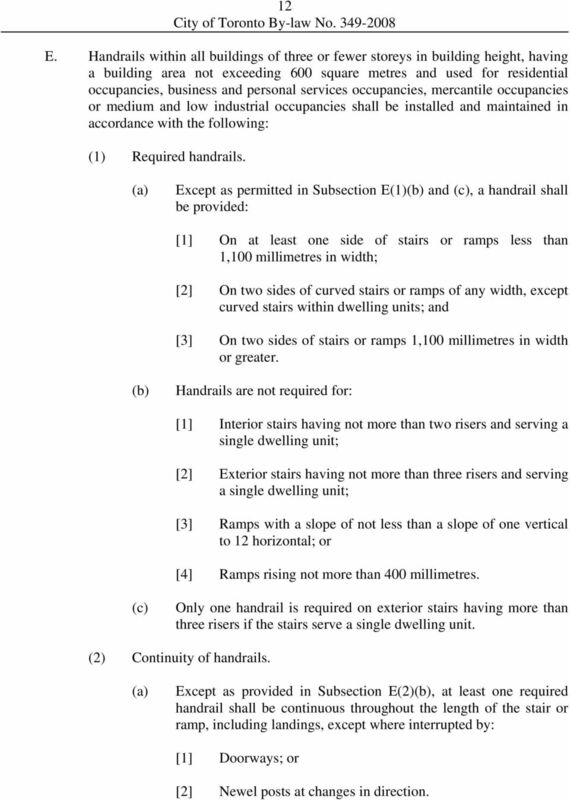 Except as required by Subsection F(2) and except where interrupted by doorways or newels at changes in direction, at least one handrail shall be continuous throughout the length of a stairway or ramp, including landings. Handrails shall be terminated in a manner that will not obstruct pedestrian travel or create a hazard. At least one handrail shall be:  Not less than 300 millimetres beyond the top riser, and continue to slope for a depth of one tread beyond the bottom riser followed by a 300 millimetres horizontal extension; and  In the case of a ramp, extend horizontally at the required height, not less than 300 millimetres beyond the top and bottom edges of the incline. 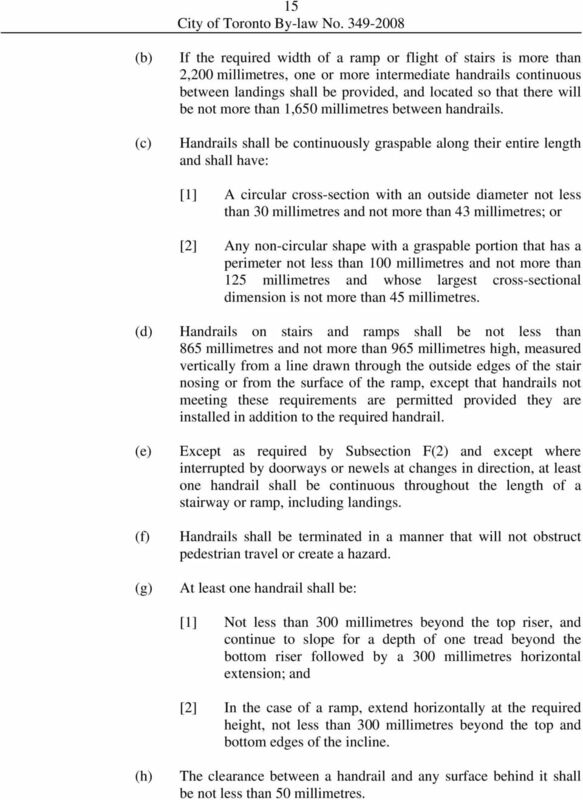 (h) The clearance between a handrail and any surface behind it shall be not less than 50 millimetres. 17 17  Principal routes providing access to exit in an open floor area;  Corridors used by the public;  Underground walkways; and  Public corridors. (d) (e) (f) (g) (h) (i) (j) Emergency lighting required in Subsection B(1) shall be provided from a source of energy separate from the electrical supply for the building. 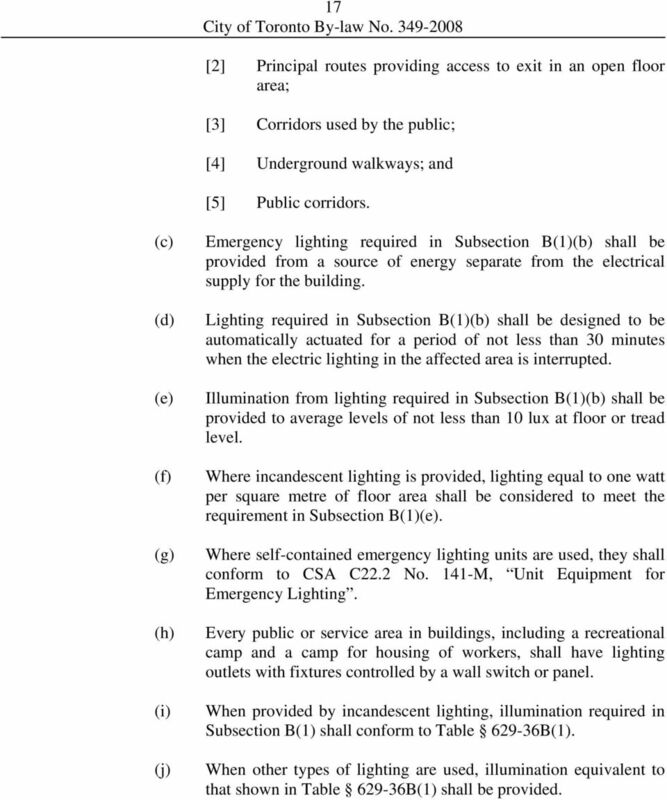 Lighting required in Subsection B(1) shall be designed to be automatically actuated for a period of not less than 30 minutes when the electric lighting in the affected area is interrupted. Illumination from lighting required in Subsection B(1) shall be provided to average levels of not less than 10 lux at floor or tread level. Where incandescent lighting is provided, lighting equal to one watt per square metre of floor area shall be considered to meet the requirement in Subsection B(1)(e). Where self-contained emergency lighting units are used, they shall conform to CSA C22.2 No. 141-M, Unit Equipment for Emergency Lighting. Every public or service area in buildings, including a recreational camp and a camp for housing of workers, shall have lighting outlets with fixtures controlled by a wall switch or panel. When provided by incandescent lighting, illumination required in Subsection B(1) shall conform to Table B(1). 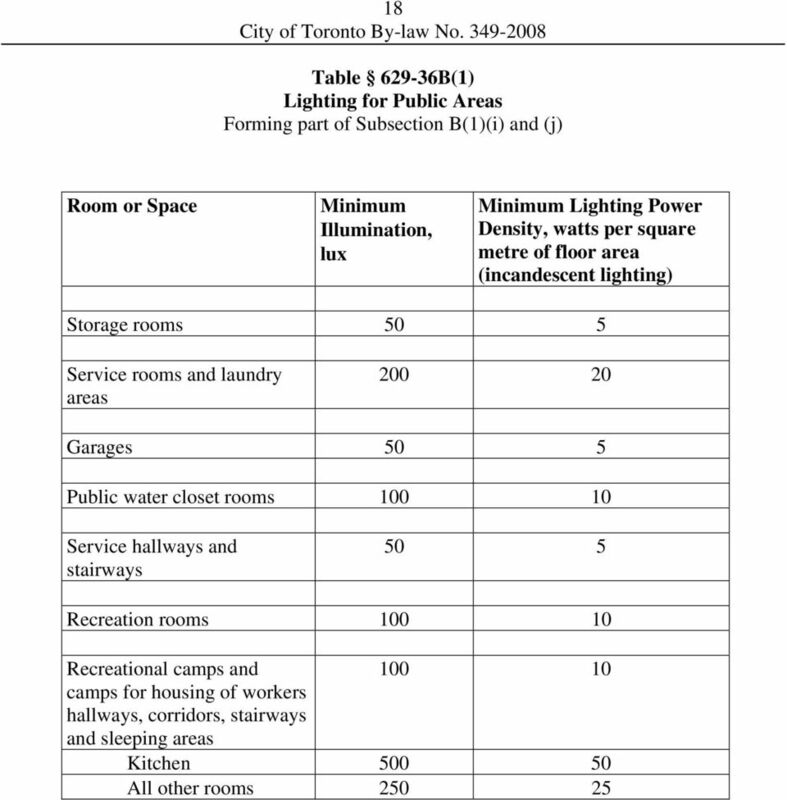 When other types of lighting are used, illumination equivalent to that shown in Table B(1) shall be provided. 20 20  Corridors serving patients or residents sleeping rooms in a Care and Treatment occupancy or Care occupancy;  Corridors serving classrooms;  Underground walkways;  Public corridors;  Floor areas or parts of them where the public may congregate in assembly occupancies intended for the production and viewing of the performing arts or other assembly occupancies, having an occupant load of 60 or more, other than arena type or open air assembly occupancies;  Floor areas or parts of them in day care centres where persons are cared for;  Food preparation areas in commercial kitchens;  Principal routes providing access to exit in a floor area that is not subdivided into rooms or suites of rooms served by corridors in a business and personal services occupancy, a mercantile occupancy or an industrial occupancy; and  Internal corridors or aisles serving as principal routes to exits in a business and personal services occupancy, a mercantile occupancy or an industrial occupancy that is subdivided into rooms or suites of rooms, and is not served by a public corridor. 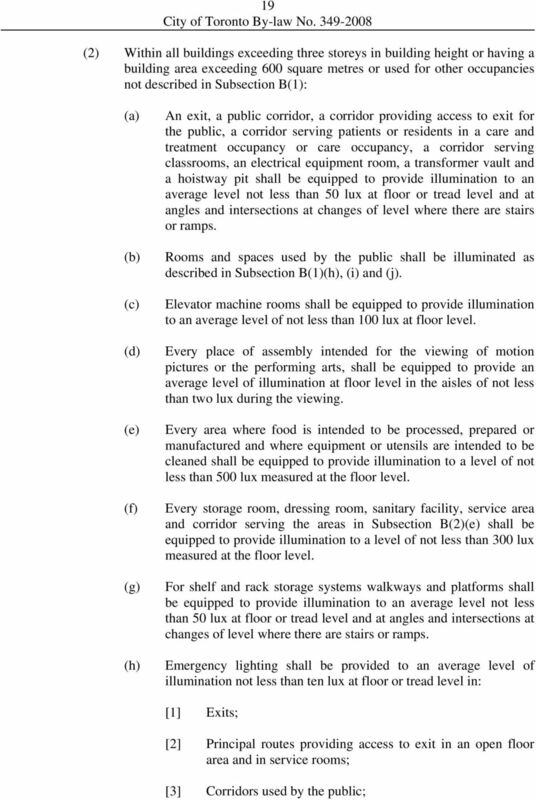 (i) Emergency lighting to provide an average level of illumination of not less than ten lux at floor or catwalk level shall be included:  In a service space in which facilities are included to permit a person to enter and to undertake maintenance and other operations; and  On a shelf and rack storage system, which includes walkways, platforms, unenclosed egress stairs and exits providing means of egress. (j) The minimum value of the illumination required by Subsection B(2)(h) and (i) shall be not less than one lux.